Compiled from one or more of the following: raw data from U.S.
Government agency sources, information from sister-in-law, Susan Ragan, May 22, 2000 and Nov 15, 2002. On 25 September 1967, SSG Geist was the observer aboard an O1D aircraft of the 74th Aviation Company piloted by Lt. Lynn R. Huddleston on a visual reconnaissance mission north of Minh Thanh, Binh Long Province, 4 miles from the Cambodian border. A radio call was received by Detachment A-332 at 0930 hours from Lt. Huddleston. No coordinates were given. 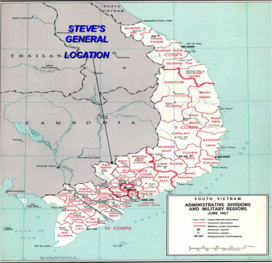 Again at 1030 hours, a call from Lt.
Huddleston was monitored by Hon Quan Radar, and Huddleston gave his position as the vicinity of grid coordinates XT633739, or a few miles from the border of Cambodia just north of Minh Thanh. This was the last radio communication with the personnel aboard the O1D. The plane never reached its destination. Search and rescue was initiated at 1310 hours, but was terminated 3 days later without any sightings of either the aircraft or its crew. No trace has ever been found. The strategic location of the Special Forces Detachment A-332 camp at My Thach was a thorn in the side of the VC and NVA. The Minh Thanh A Team camp was located off Route 14 in Binh Long Province about 22 miles south of the Cambodian border and 35 miles east of Tay Ninh (nearby is Nui Ba Dinh mountain). This area was heavily occupied by both local VC battalions and NVA troops, who, at the time were entrenched in the heavily fortified strongholds north of the Iron Triangle and close to the Fishhook area of Cambodia and South Vietnam. This area was the site of Operation Junction City 1, February to May 1967. Additionally, at this same period of time, many enemy troops were pushing down the Ho Chi Minh Trail, infiltrating and preparing for the Tet Offensive of 1968. It is highly likely that SSG Geist and Lt. Huddleston overflew a concentration of enemy positions that the enemy did not want identified. April, 1946. His interests while growing up included the Boy Scouts, swimming, speology (cave exploration) and the Civil Air Patrol. All of his activities indicated a desire to be part of a well functioning team. Personal glory was not his goal, but rather the joy of a group of men, highly motivated to excellence and dedicated to an interest which molded them into oneness. Later, this desire manifested itself in Stev's intention to become part of the U.S. Army Special Forces. 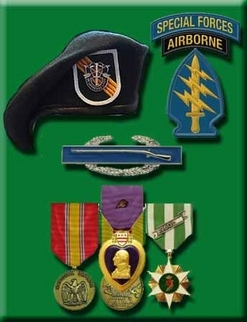 The proudest day of Steve's life was when he was awarded his Green Beret. After training, Stephen volunteered for Vietnam. He served as a demolition and small arms expert on "A" team supported by a Provincial Unit of ARVN. After six months of heavy combat, Geist was pulled back to a supporting filed unit of the Special Forces. 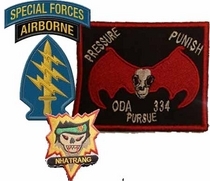 A-332, 5th Special Forces Group (Airborne), III Corps, War Zone C, Republic of Vietnam. 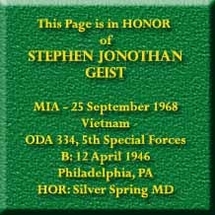 As a member of this 12 man team, SSG Geist was responsible for the training of indigenous SVN troops in the operation of heavy weapons - machine guns, mortars, recoilless rifles, infantry tactics and training, and camp defenses. He also accompanied troops on combat patrols. His letters home to his family did not brag on 100 ways to kill, but rather the thousands of ways he learned to preserve life and aid others from his training. He spoke of the privilege to be associated with men who shared his dedication and belief that freedom cannot merely be wished for, it must be earned from work. He never spoke in apathy of the Vietnamese, but rather the courage of these people to be mutilated and die for their right to self-determination ... free from fear or coercion.